This cup is finely modelled in translucent porcelain. The exterior is elegantly enamelled with pink peonies, framed by a pink-ground border of lotus and Buddhistic emblems and a scalloped, gilded rim. 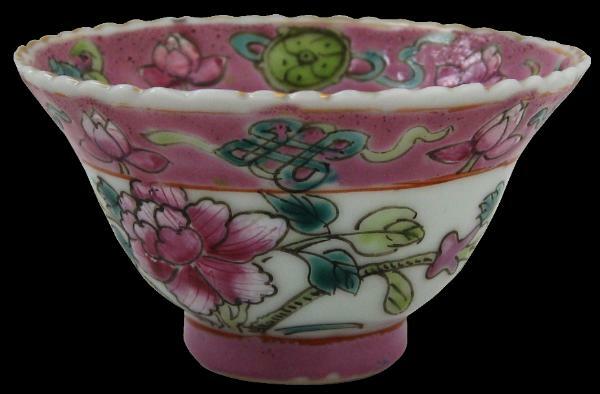 The base of the interior is enamelled with a small peony bloom. The base is stamped in Chinese with ‘Salak Yu Xing Long’ – a name which appears to be a retailer’s name. The mention of ‘Salak’ is suggestive of Singapore – it was the old Hokkien name for Singapore. This is a rare and perhaps hitherto unrecorded mark.